1 combine beans tomatoes, celery, bell pepper, green onions, garlic, hot pepper sauce,Worcestershire sauce,and bay leaf in crock pot:; sir to blend cover; cook on low 4 to 6 hours or on high 2 to 3 hours. 2. mesh beans mixture slightly in crock pot until mixture thickens. Cover and cook on high 1/2 to 1 hour . 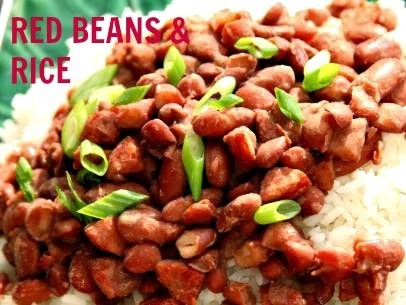 Remove and discard bay leaf, Serve bean mixture over rice. G'day! I could go for some of this right now! Thanks Joanne and cheers to you! There's nothing quite like a crockpot for great fix it and forget it meals! I love coming home to a hot pot of delicious rice and beans. There's nothing quite as satisfying and filling. Thank you so much for sharing this healthy and delicious recipe at the Plant-Based Potluck Party Blog Hop! I appreciate it!